Hey guys! I wanted to share with you some of my favourite places to eat in Bali, Indonesia! As you may have been able to tell from my Instagram feed this year, I have been living in Bali! well, coming and going very frequently. Yep, that kinda makes me an 'EXPAT' here. I guess there are many ways to experience Bali and it's culture. I have definitely experienced it in different ways. I first visited Bali in 2010 for my schoolies trip (like leavers or spring break), so of course my trip was much, errr, different... We stayed in Kuta, trolled the famous Poppies lanes hunting for bargain sunglasses, drank double double vodka red bulls or 'arak attacks' and partied in all the clubs every night. Even dabbled in some funky mushrooms from some dodgy guy on the street one night (hope your not reading Mum and Dad). So of course, that side of Bali still exists, however my lifestyle here is much more tame.. There is definitely still a huge party scene here in Bali, but I don't really venture out past dinner time these days. What I love most about Bali is the vast amount of insanely delicious food options, particularly vegan and vegetarian food. The amount of cafes and restaurants popping up across Bali is actually insane. Owned by westerners and Indonesians alike. It is incredibly easy to be healthy here, we are spoilt for vegan options, and also incredibly affordable. So of course, moving to Bali was an easy decision after my holiday at Christmas to visit my sister, Lauren (@gypsea_lust), who lives here too. We have been travelling all of this year, using Bali as our home to settle back into between trips. While back in Bali we can get back into a nice routine. Gym everyday, homemade smoothies and dinners, going out to our favourite vegan cafes in Bali, or trying new ones, visiting the local 'Pasar' (market) to pick up fruit and veg for uber cheap prices, like really cheap. We buy our tempeh from a roadside stall and it costs us 20 cents per block (back home this kind of thing sets you back $6-10) and dragonfruits for 50 cents- $1 each (Again, back home around $5-10 each.) So the costs of living here are really reasonable. Even our rent and gym memberships are half the price, and of course to get to destinations around the world we have major hubs like Singapore and Hong Kong nearby. Whenever we travel out of Bali for an extended period of time we always miss it! Well, mostly the food. It's so accessible (we have Go-Jek, a food delivery app like uber eats) cheap, healthy and incredibly beautiful/ photogenic! So writing this while sitting on my ferry across the seas in Greece is making me ultra homesick. Well you guys asked for it, so here it is! Keep reading for my ultimate foodie guide to Bali! I've split it up into areas of Bali, with lots of insanely drool worthy photos. Drop a comment if you have any questions at all, and if theres some of your fav cafes from Bali missing here, let me know so I can check them out! Pancakes, avo good-day and moonshine morning bowl, breakfast favourites. Ladies luncheon at Peloton Supershop, all the food a girl could want. This is my Aloha Poke Bowl, another signature dish on the menu designed by me. Lunching in Peloton is always such a treat. The spreads are incredible. Green Ginger Noodle House is located in Berawa, on the same road as Peloton Supershop. It is a vegetarian mixed Asian menu with loads of vegan options. Everything we have tried has been so delicious! Some of the best asian food I've eaten! Some of my favourites include the San Choy Bau, Larb, Pad Thai (vegan without egg), Dumplings, Vegan Pho, Tom Kha Gai, and Thai curries. They also serve drinks such as kombucha, iced coffee, & matcha lattes. They're open for breakfast also, serving smoothie bowls. Love grabbing takeaway or getting GO-JEK delivery from here! Two Trees Eatery is a new spot I've just recently discovered! Located in a quieter area of Berawa. I've recently become a regular here!! (since I first wrote this blog post) They now open for breakfast, lunch and dinner. The menu isn't vegetarian or vegan but they have SOOO many amazing options!! Lots of sprouted, fermented foods and healthy dishes. Some of my favourite dishes are: 'Let us falafel', 'Rooted' and 'Farmacy Bowl' (all salads), the Bun-Less Vegan Burger (soooooo delicious), & Vegan Poke Bowl. For breakfast I've tried the banana peanut butter toast, and vegan chickpea omelette. They serve loads of vegan options, plant based milks, vegan desserts (really yummy lemon tart) and colourful lattes. La Laguna is a great spot for a sunset cocktail and dinner! I recommend making a booking because it can get busy and a sunset view table is the best. Stepping into La Laguna is like a gypsy dream. The entire property has been decorated with a Spanish gypsy vibe. Think fortune teller carriages, vine covered walls, tinted lampshades, fairy lights, wooden decor and bohemian cushions. They serve Spanish tapas style food (honestly not the best for vegans) I usually get the pita, hummus and olives or the veggie kebabs with cous-cous and no yoghurt, but worth visiting for some sunset drinks, the beach view and to check out the amazing property. My favourite smoothies in Bali, the Kale Storm and Choc Tops. Spread of all things: Crimped Noodle, Gone to Ground Wrap, Tempeh Bowl, Naked Falafel. Poke Poke is located in the popular strip of Canggu (Batu Balong), near Deus Temple. It's a great spot to grab a quick and healthy lunch after the beach. I'm sure you can guess they serve poke bowls! (A popular Hawaiian dish, usually with raw fish). You can select your bowl from the list of different varieties, choose your size, change your grain, and add extras. My favourite combo is the vegetarian poke bowl, I swap the tofu for the sesame crusted tempeh (it's ahhhhhmmmaaazzziiinnggg), with brown rice, and add mango and nori sheets. If you eat seafood then you'll love any of their fish poke bowls. They also serve sushi donuts, and sushi burritos (turn your favourite bowl into a burrito wrapped in nori paper. They also deliver via the phone number above. My favourite poke bowl (centre), vegetarian poke bowl with sesame crusted tempeh, mango and nori sheets. On the left is Alex's poke burrito with tuna and on the right some vegetarian poke donuts. The lawn is my favourite local spot for a sunset cocktail! Iconic images of this spot are probably familiar to your IG feed! From the rooftop you can get a great view of the sun setting over the beach with their lawn below, covered in cushions, bohemian style umbrellas, palms, live music and strings of glowing fairy lights. My favourite cocktail is a classic margarita or the chilli sour. Their share style menu has a couple of vegan options. The cauliflower "steak" is great! They have a pool overlooking the beach which makes it a great place to hangout and have some lunch with friends. Make sure you book if you are in a group or want a good sunset spot. Paletas Wey is my favourite spot to grab a fruity ice block after dinner or on my way home from the beach. They have loads of different flavours, not all are vegan. My favourite is the soursop (like custard apple), watermelon & lime, or strawberry. They have a couple of stores across Bali/Indonesia. You can find them up in Uluwatu as well as Canggu. Balibola is a newbie thats just opened up in Seminyak. 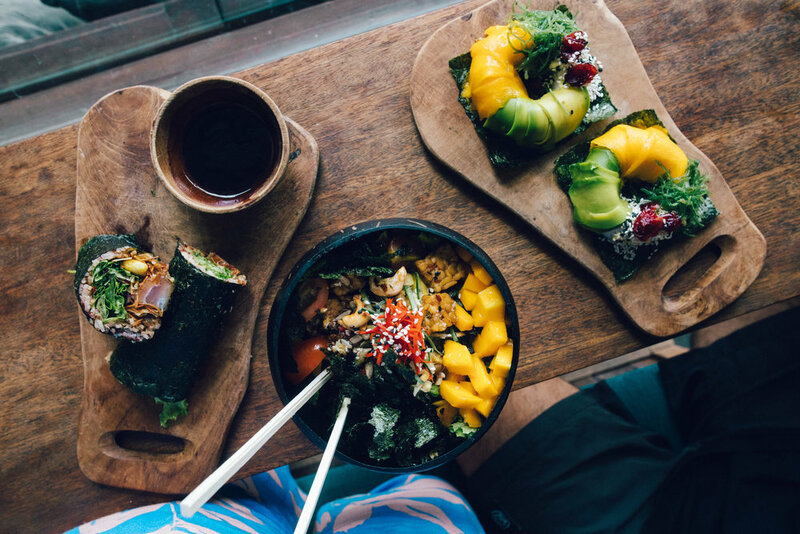 It's Bali's first 'Flexitarian' cafe. Which if you're unfamiliar with what Flexitarian means... It is a diet that is plant-based with the occasional inclusion of meat/seafood/dairy/eggs. That means this menu features a tonne of plant based options, plus a handful of non-vegan options - perfect for groups where everyone has a different dietary preference. Everything you see in my pictures are vegan! I haven't tried the whole menu (theres sooo many things!) but everything we did try was absolutely delicious and presented beautifully - they even have their own custom plate-ware! In case you are wondering what to order, we have on this table: the granola bowl (vegan w/ coco yoghurt), vegan pancake stack with berries, coconut whipped cream, caramelised banana and chocolate sauce, the quinoa bowl (a rainbow bowl of nourishment), fruity rice paper rolls (they're mock chicken ones also sound delicious! ), vegan cookies AND AVOCADO FRIES!! (which by the way were absolutely amazing!). Shelter Cafe is located in the heart of Seminyak shopping area. It is a plant-filled haven, serving a heap of different options (lots of vegan/vegetarian dishes). They also have a Nalu Bowls downstairs so you can get smoothie bowls brought up to your table. My favs are the Falafel Salad and Crunchy Tempeh noodle salad plus a big juicy coconut. Mad Pops is my favourite spot to grab a gelato becauseee its a 100% vegan gelato shop- coconut based gelatos/ice-cream. Plus they're all natural flavours. It's a tiny little store so can get busy quickly. I love to pop in for a scoop or two ;) my favourite flavours are the rainbow, Oreo, and blueberry coconut swirl. 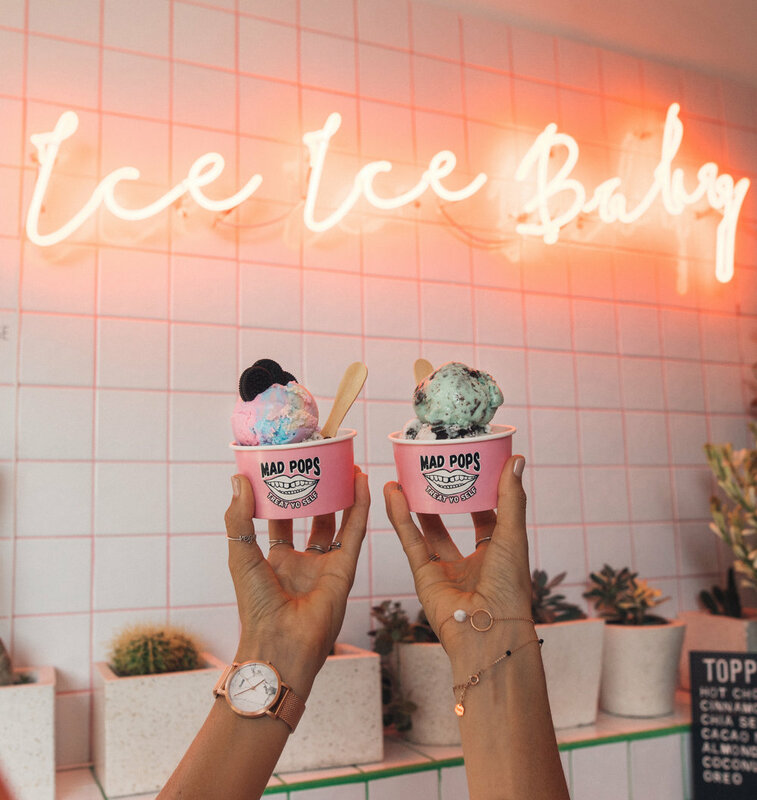 You can also select from a list of toppings and get a totally instagrammable pic in front of their neon ICE ICE BABY sign. They also make artisan popsicles that are stocked at a heap of cafes across Bali including Peloton Supershop, The Shady Shack, and The Spicy Coconut. Revolver Espresso is the best spot for a coffee in Bali. Hidden away down an alley off of the main strip in Seminyak (Seminyak square area). It is a boutique coffee house, that also serves food and cocktails (breakfast, lunch and dinner). The perfect place to escape the hustle of Seminyak. Swing through the front wooden doors and step into another era. Old School posters, neon signs, guns, and Wild Wild West decor. The beats are always great, cold drip coffee is the bomb, and the food looks delicious! (yes theres a couple of vegan options too). They have a second mini revolver cafe towards Umalas and their coffee is also stocked in loads of cafes across Bali including Peloton Supershop and Milk & Madu. Sea Circus is a cafe/restaurant and bar located in Seminyak. Probably one of Seminyak's most iconic cafes, thanks to Instagram and it's photogenic circus themed front seating. Sea Circus serve breakfast, lunch, and dinner with some vegan options. My favourites are the smoothie bowls (dragonfruit), tofu buddha bowl and jackfruit tacos. They have loads of Mexican and American diner style menu items, cocktails, smoothies, and juices- something for everyone. Kynd Community are the new kids on the Seminyak block and killing it. This place is also 100% vegan. Located a short drive from Seminyak Square (near Potato Head Beach Club). They're open for breakfast and lunch. Make sure you try out one of their smoothie bowls, with a personalised decoration on top. They also serve smoothies, juices, and coffee. If you are after something sweet they serve waffles, Oreo freak shakes, and various raw desserts. There is a selection of different topped toasts, vegan cheeseburger, and Buddha bowl style salads (with fricken- fake chicken, tempeh and tofu). Oh and don't forget to get a photo in front of the pink palm wall, it's totally Insta-worthy. Kismet is my favourite place to eat in ubud! I literally stop by there for lunch every time I visit. There is actually loads of amazing places to eat in ubud but as I don't live super close my visits are usually just for the day and I can't help but go back here every single time. (That's how gooood it is!). Kismet is open for breakfast, lunch and dinner- they even have an extensive cocktail list. It's all vegetarian but with a heap of vegan options. My favourite dishes are the summer rolls with peanut sauce, vegan nuggets (they will fool you! ), dragon sushi cones, chilli garlic edamame, 666 spicy jackfruit salad, Asian salad bowl (with tempeh and satay skewers) - this dish is my favvv, kimchi, avo, nori, salad, rice, skewers. Ahh. So. Good. They have a heap of different options on the menu, and likely to have something for anyone! Alchemy is my favourite morning stop in up in ubud. 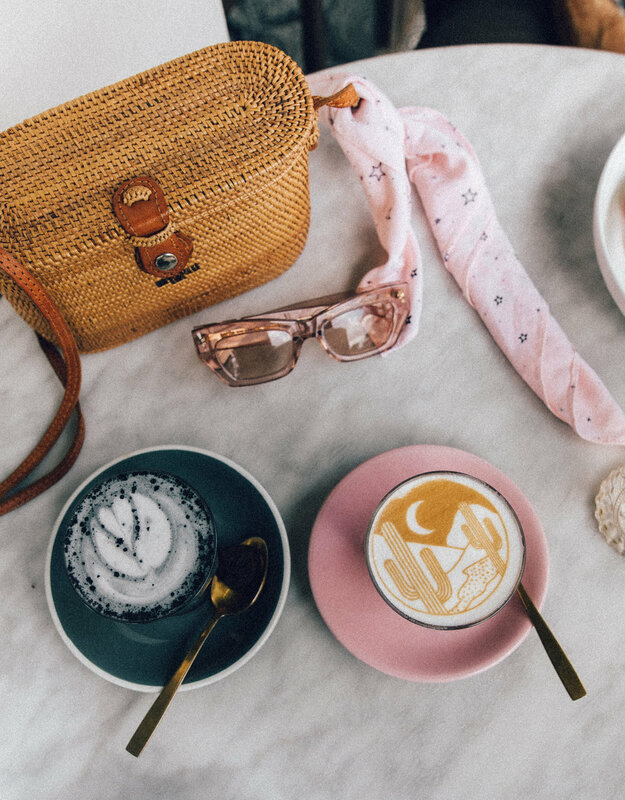 If we head up there for an early morning shoot in the rice paddies, waterfalls or ridge walk, we usually stop by Alchemy for coffee and breakfast. Alchemy is 100% plant based and mostly raw. They have a heap of homemade plant based milk options, a build your own smoothie bowl station where you select your smoothie, granola, fruits, sauces (like berry sauce or caramel sauce), and extra toppings. We've also been to Alchemy for lunch, where they turn the build your own smoothie bar into a salad bar. They also have a huge menu of vegan and raw foods at lunch and dinner and often host workshops. It's also located in a nice spot away from the hustle of ubud. Sorry - no photos from this location yet! Coco & Poke is another poke shop in Bali worth visiting, especially if you're in the Uluwatu area. We love driving out to Uluwatu for a beach day, shooting content and grabbing a quick healthy lunch here at Coco & Poke. You build your bowl following the menu directions. Starting with a size of bowl, grain, protein, salads, toppings and sauces. They also serve cold press juices and cocowhip desserts. Well, there is my ultimate foodie guide to BALI, for now.. There is ALWAYS new places opening up and so many more places to try out. I'll be editing this to add any new favourites as I find them. I hope you have found this useful!! Drop a comment if you have any feedback or suggestions for places I should eat, or blog content you would like to see. psst. don't forget to subscribe to my blog to be the first to see new posts AND get a free mini EBOOK! !